Malay Apple! – Design Research. Experience. life. 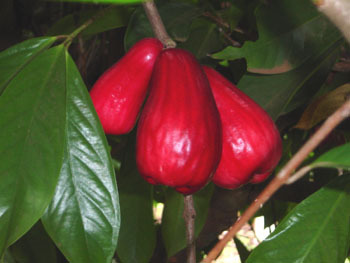 ‘Jambu Merah’ botanically identified as syzygium malaccense, web the fruit is also called Malay rose-apple and mountain apple. Recently I’ve read an articles from News Strait Times about Malay apple. I was shocked thinking when did Malaysian manage to produce an apple? We can’t even get the apple tree growing because of the climate. It is an interesting column wrote by K.P Waran with the title: Go Global with the Malay Apple. Apparently not many Malaysian knows what fruit is it, help not by this name for sure. A very beautiful fruit, usually deep red in color, pear shaped, with a waxy skin, about the size of an apple. Flesh is crunchy, often juicy, with a mild sweet flavor. Some varieties have white or pink skin. Surprisingly Malay apple even have its name in French ‘pomme de Malaisie’ and Spanish ‘pomarrosa Malaya’. Quote (Morton, J. 1987. Malay Apple. p. 378–381.) In: Fruits of warm climates about the origin and distribution of Malay Apple, “‘The Malay apple is presumed to be a native of Malaysia. It is commonly cultivated from Java to the Philippines and Vietnam, also in Bengal and South India. Portuguese voyagers carried it from Malacca to Goa and from there it was introduced into East Africa. It must have spread throughout the Pacific Islands in very early times for it is featured in Fijian mythology and the wood was used by ancient Hawaiians to make idols. Indeed, it has been recorded that, before the arrival of missionaries in Hawaii, there were no fruits except bananas, coconuts and the Malay apple. The flowers are considered sacred to Pele, the fiery volcano goddess. 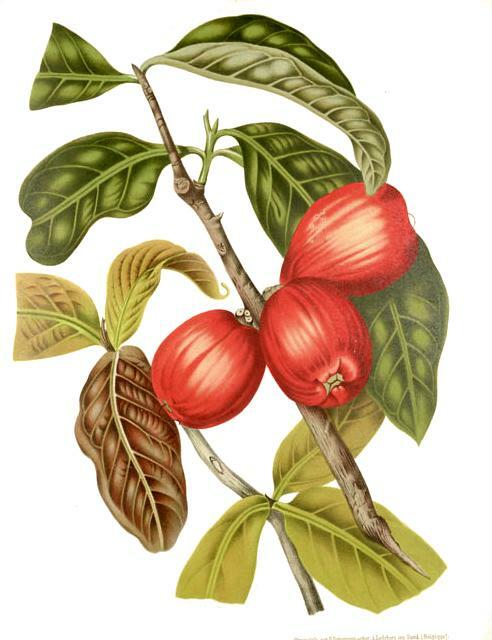 Captain Bligh conveyed small trees of 3 varieties from the islands of Timor and Tahiti to Jamaica in 1793. The tree was growing under glass in Cambridge, Massachusetts, in 1839, and specimens were fruiting in Bermuda in 1878. Since the Malay apple has a strong historical link to Malaysia and countless documents exist calling it by the name, it would be appropriate to return to the name and promote it as a Malaysian product. As been suggested by K.P Waran in NST column, and I completely agree with him, I think it’s about time we give back the name ‘Malay Apple’ or in Malay might be ‘ Jambu Melayu’ to ‘Jambu Merah’. It will be an excellent way to promote Malaysia as the fruit country’s of origin and Malaysian product. Perhaps in few years it might increase the plantation of ‘Malay Apple’ in the country. CategoriesCatchy, Design chat, Visual communication, Why I'm doing this research?